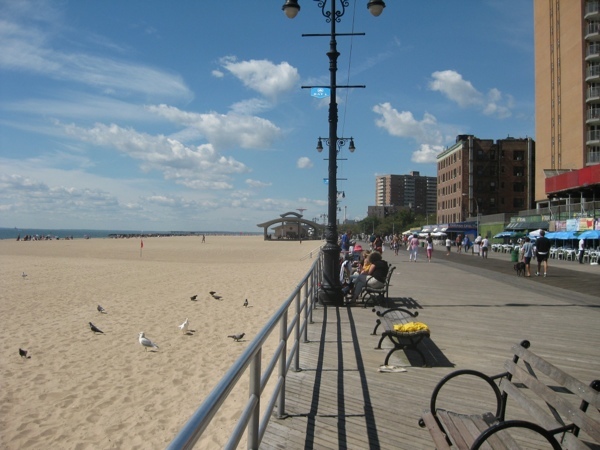 Last Sunday we caught the subway to Brighton Beach, and walked along the sand to Coney Island. Other than that, there isn’t much to say. It was a lovely sunny day, we paddled, Tom ate a chilli cheese hotdog, we watched people going on rides at the amusement park. Despite the beautiful weather it was all pretty quiet – a few sunbathers and swimmers on the beach, and several people fishing from the pier, but it was clear that the summer season is very much over. It was a little strange to be on the beach less than a hour away from central Manhattan – it’s the last thing I tend to think of whilst in the city – but it was lovely to get some sea air. Given that it’s such an easy train ride away I can see us coming back for walks throughout the winter. 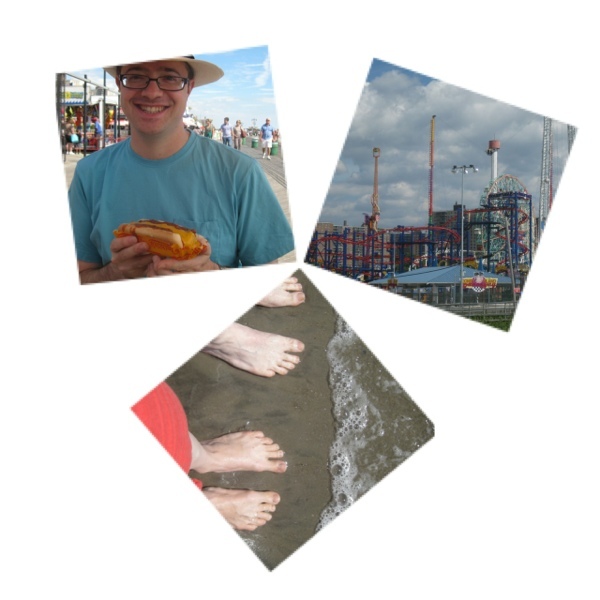 This entry was posted in Exercise, Exploring and tagged beach, Brooklyn, Coney Island, hot dogs by Emma Davidson. Bookmark the permalink. I take it that’s a Nathan’s chilli cheese hotdog? Did you go on the rollercoaster? We went to Coney Island when we visited, didn’t stay for long though. It is indeed a Nathan’s hotdog 🙂 I must admit I wimped out of the rollercoaster, though Tom is very keen so we might give it a go one day…! It’s a little… erm…. jolty. I wished I’d been wearing a sports bra. !!! I’ll have to bear that in mind!